As a congregation, Kol Ami has an in-depth commitment to Tikun Olam and has collectively stretched out its hand to help our world family with both local and international humanitarian initiatives. With a strong focus of alleviating hunger, Kol Ami donates food at Yom Kippur and periodically throughout the year to the Vaughan Food Bank. We also volunteer at the Food Bank to sort out food donations and we can organize specific volunteer dates to suit families or groups to volunteer there. The Social Action Committee also makes financial donations to the Food Bank from their fundraising initiatives. In 2016 alone, there was a 20% increase, up from 2015, of families in dire need within our community, who visited the Vaughan Food Bank. Since partnering with Temple Har Zion since 2012, Kol Ami is very active in providing financial support to the program through our High Holy Day appeal. In addition, Kol Ami volunteers work at Har Zion every Wednesday, from November through January, by serving meals to the homeless guests and working in the basement “shop”, helping guests to find suitable clothing and toiletries. For many years, Kol Ami volunteers have prepared a delicious dinner for the Out of The Cold guests. It is quietly rumored that the Kol Ami dinner is the finest of the season. The Kol Ami Blood Donor drive commenced in 2016 and clinics will run every three months throughout the years. All clinics are held at the Hillcrest Mall Canadian Blood Services office in Richmond Hill. All Kol Ami clinics will be advertised at least one month in advance. Since 2004, Kol Ami volunteers go to the Thornhill Farmer’s Market every Sunday to collect left over perishable food items from most of the vendors. These donations are immediately taken to the yellow Brick House Women’s Shelter in Aurora, which houses abused women and their children. This food donation enables the Yellow Brick House to use part of their food allocation budget to further help the women and children get a new start in life. No matter the weather, rain, snow, mail or sunshine, these dedicated volunteers take turns to do this mitzvah, having never missed one day. Periodically gift bags are made for both the mothers and children. Commencing in 2012, Kol Ami has found a unique way to say “thank you” to our brave firefighters by providing a wonderful home cooked Christmas Day lunch. Over the last few years the Christmas lunch has taken on a distinctive Jewish flavor with chicken soup, matzah balls, brisket and all the many trimmings. Volunteers and their families take their dishes to the fire station every December 25th morning, and are treated to photos taken with the firefighters, plus everyone is invited to sit inside the fire trucks. It’s a fun time for all. 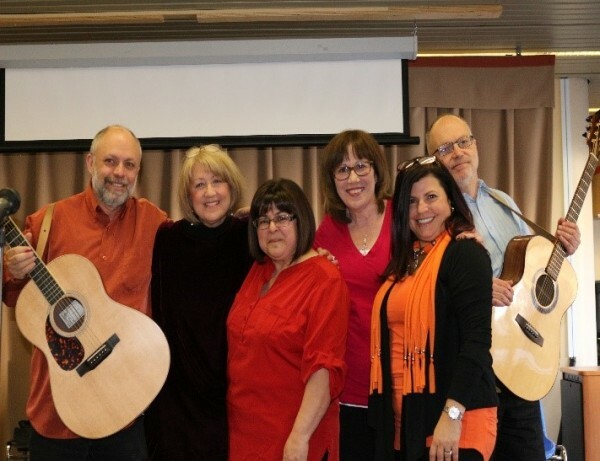 A special group has been formed called the Kol Ami Singers, who perform at nursing homes and cheer up the residents with their wonderful concerts. We have also had a volunteer magician and a yoga laughter teacher who have entertained he residents. We are always looking for diverse entertainers for the residents. The Ronald McDonald House in Toronto hosts out of town families, who have gravely ill children having treatment at Toronto hospitals. Kol Ami has provided gifts, donated by members of the congregation and businesses, plus recruited a volunteer clown and magician to entertain the children and their families. Volunteer entertainers are always needed. The committee’s fundraising endeavors have helped to buy medicine for a hospital in Africa, bought necessary items for Covenant House for street youth, helped families of the Nepal Disaster, brought joy to the Jewish veterans at Sunnybrook Hospital K-Wing by enhancing their Channukah parties and providing funds for their daily ice cream cart and purchase treats for nursing home residents. Since 2004, Kol Ami has participated in many international humanitarian causes. This includes collecting over 1,200 prescription eyeglasses for a rural hospital in a remote part of Zimbabwe. Additionally for Zimbabwe, 200 new t-shirts, 200 flip-flops, 500 hundred toothbrushes and tubes of toothpaste were gathered by Kol Ami’s religious school for God Knows Orphanage for AIDS orphans and a local school. The children were overjoyed to have for the first time in their lives, a new piece of clothing and toothbrushes instead of twigs. Kol Ami has also participated in the creation of 3 new water wells in one of the most poverty stricken regions of Zimbabwe as well as helping to fill containers with medical and school supplies. Kol Ami’s Social Action committee continually looks for new ways to reach out to help the marginalized and sick within our community. The committee welcomes enthusiastic volunteers to truly want to make a difference in the lives of others.